I want to start off with the caveat that I didn't like this book. I started off liking it, and while I mostly liked Jess and thought that the trans representation was good, I didn't like the rampant fatphobia and it actually made me want to not finish the book. I'm 33 years old but I can still get affected by stuff like this, so I dread to think how I would have felt twenty years ago, and I feel awful for any readers who may have been affected. You are not unloved or invalid as a human just because your body is bigger than some other people's bodies. Secondly, while this book is about a trans person, it's not BY a trans person. It's by the mother of a trans person, she writes about her daughter in the front of the book. While this obviously means that she knows a lot about parenting a trans girl, it doesn't mean that she knows how her daughter feels. It's not her own voice and I think that needs to be noted. Where did I get it? Amazon, I went on a bit of an LGBTQ+ splurge in January and this was one of the books I bought. My partner and I have actually been going through my books and I have a LOT of LGBTQ+ Young Adult books! I'll show you photos of my collections once all the books are sorted. What's it about? Jess is a trans girl and has just left school. While there, she hasn't been out, so she's been living as a boy, but she's planning to start college as a girl. She couldn't start hormones any earlier because her dad refused to give his permission for her to do so, and so she hasn't been to Chicago to visit him since they fell out. He's getting married to Jan, her mother's ex best friend, and while he sent Jess an invitation, she told him she wasn't going. 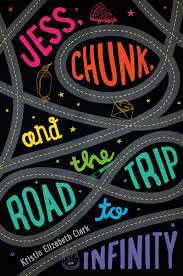 However, she and her best friend Chunk are planning to drive across the country so Jess can attend - as a girl. Chunk is described as "big", and his got his nickname from a counsellor at camp who gave it to him. Near the beginning of the book he tells Jess that their schoolmate bullied him, and Jess is pretty oblivious about what he's been through, and dismisses his struggles as not being as bad as hers, basically. This obviously annoys him and as we go through the book he lets Jess know this more and more. He's texting a girl in Illinois and Jess is jealous, and pretty unreasonable about it too, in my opinion. She also keeps going on about his body, and to begin with I thought this was just Jess the character being a bit rubbish on body positivity. However, at one point, the two meet a girl, Annabelle, and end up going back to her house with her for the night. And there we meet her grandmother, Mamie, who is agoraphobic and doesn't leave the house because of panic attacks. That's totally legitimate, of course, but Mamie is described in the most fatphobic terms possible, and for one thing I want to make clear that not all people who don't leave the house are fat, and obviously lots of fat people are going out into the world and working and having friends and all of that kind of stuff. I don't think that the fatphobia was just Jess' character; it was so insiduous that I feel like it was the author's views coming in too. Even when Jess is called out, it didn't go fair enough for me as an apology for the horrible things she had thought and said. I didn't like this aspect of the book at all, and was going to give it one out of five. However, I think the trans representation is good, and there's no violence towards Jess as a trans person, so I'm giving it two with a LOT of caveats. Are any main characters disabled either mentally or physically? No, well, I guess Mamie isn't that main of a character but she has mental health issues obviously. Are drugs mentioned or used? No, I guess there's some mentions of Jess' hormone drugs but that's all. Why did I choose to read it at this point in life? I found it again while sorting out all my books. What other books is it like? It's actually a lot like one I've written myself, but I can't tell you to read that, can I?! Where is the book going now? I'm not sure. As I didn't like it, I don't know that I want to pass it on to anyone!